Scott Braden, left, wilderness advocate for Conservation Colorado, shows U.S. Rep. Raul Grijalva (AZ-03) a map of a proposed special management area in the Tenmile Range near Officers Gulch on Thursday, May 7, 2015, as U.S. Rep. Jared Polis (CO-02) looks on. Polis will reintroduce a bill later this month that would designate more wilderness and protected areas in the High Country. 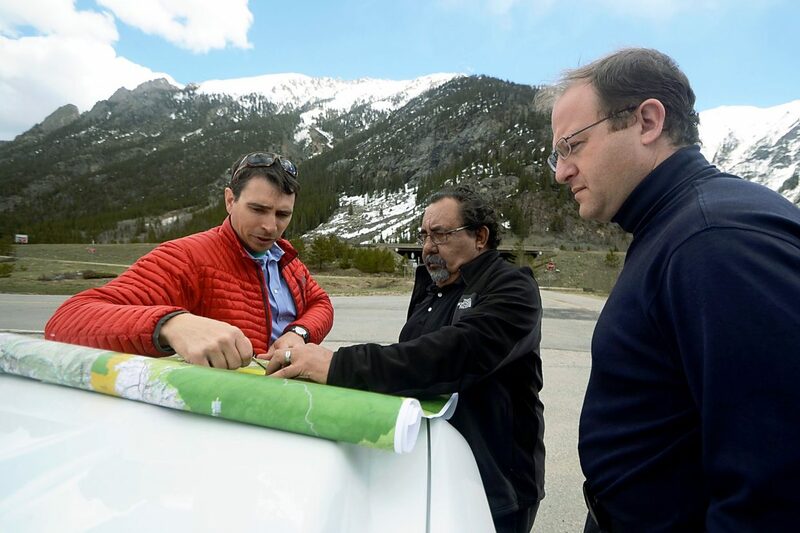 U.S. Reps. Jared Polis (CO-02) and Raul Grijalva (AZ-03), the top Democrat on the House Natural Resource Committee, toured Summit County Thursday, May 7, to look at proposed wilderness and special management areas in the White River National Forest. Driving west, they stopped at Loveland Pass, Sapphire Point and Officers Gulch, and Conservation Colorado wilderness advocate Scott Braden showed Grijalva which mountains and forests he saw would be included in the bill Polis will reintroduce later this month. The representatives also participated in a lunchtime roundtable discussion in Vail with about 30 local elected officials, large and small business owners, water suppliers and wilderness advocates who worked with Polis to craft the bill, so Grijalva could hear from locals about why they support the wilderness protections in Polis’ bill. The roundtable included Summit County Commissioner Karn Stiegelmeier, Summit Huts Association director Mike Zobbe, Breckenridge Outdoor Eduation Center director Bruce Fitch, Silverthorne area resident and nature photographer John Fielder, Vail Resorts vice president of natural resources and conservation Rick Cables, longtime High Country resident and business owner Dave Gorsuch. Several people expressed concerns about energy development, and some suggested Polis convince those opposed to the bill that wilderness is the energy source for the High Country. Garett Reppenhagen, a Park County resident and the Rocky Mountain director of the Vet Voice Foundation, spoke about what wilderness meant to him after his military service. Grijalva, whose influence on the Natural Resources Committee could help move the bill to a House vote, said he was impressed by the bill’s broad local support. The bill would protect 58,000 acres of wilderness lands in Summit County and eastern Eagle County and create new wilderness areas in the Tenmile Range, Hoosier Ridge and Williams Fork Mountains as well as expand the existing Eagles Nest, Ptarmigan Peak and Holy Cross Wilderness Areas. The plan also would create an 11,500-acre Recreation Management Area in the Tenmile Range near Frisco and Breckenridge that would be managed like a wilderness areas but would allow mountain biking. The proposal was drafted in partnership with local stakeholders so that it maintains existing recreational uses and accounts for future improvements local communities valued. With his new seat on the House Natural Resources Committee and Grijalva’s engagement, Polis said he is optimistic about moving the bill through Congress this session. For more information about the bill, which Polis is working to retitle through a naming contest, visit polis.house.gov/wilderness.